The IOtech brand DaqLab/2000 Series from Firetail DAQ provides bench-top data acquisition capability for a wide variety of laboratory applications. Compared to traditional digital multimeters, the DaqLab is 1,000 times faster and is capable of measuring a wider variety of signals. Built into the DaqLab is a 16-bit, 200 kHz A/D converter. Signal I/O is on the front panel via removable screw-terminal connectors, and additional I/O is via rear panel DB37 connector. Front-panel I/O includes 8 voltage inputs, 4 analog outputs, 4 frequency inputs, 2 timer outputs, and 6 digital I/O. 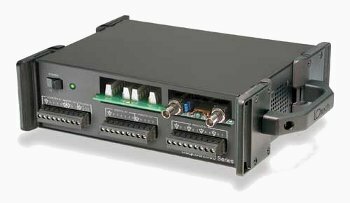 There are two DaqLab/2000 series modules to choose from; the 2001 is as specified above and the 2005 model ships without the analog outputs. The DaqLab can expand its built-in analog and digital I/O with the DBK family of over 40 signal conditioning and expansion options. There are two slots built in to the DaqLab chassis to accommodate two of these DBK cards. Signals attach to these DBK cards via on-board screw terminals or BNC connectors, which are accessed from the front of the DaqLab. If additional I/O is required, then any of the DBK options can be attached to the rear-panel P1 and P2 connectors, allowing expansion up to hundreds of analog and digital I/O channels. See the DBK table below for the full list of signal conditioning options. The high-speed Ethernet interface built into the DaqLab insures that all acquired data flows into the PC in real time, eliminating the need for local data storage or expensive memory options. Contact our team today to find out what Data Acquisition device is the right one for your application.